Material: Cotton (Exclusive Of Elastics). 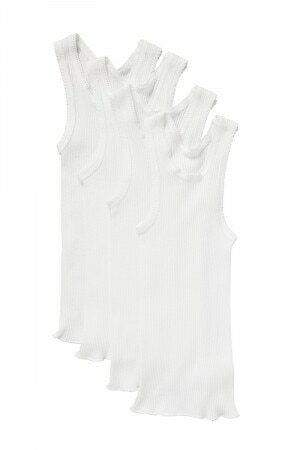 Baby Vest 4 Pack is rated 4.8 out of 5 by 13. Rated 5 out of 5 by Scottyk from Great products I bought these for my first grandson who lives in Scotland, vests great, just disappointed with the extra taxes that I had to pay to have them delivered there. Made the cost prohibitive, so will not purchase anything online to be delivered in Scotland, will have to make sure I take them in my luggage when I visit or keep them in Aus until my family visit. Bonds products have been admired by all in Scotland as different for what's available here. Thanks Bonds. Rated 5 out of 5 by Breenie49 from Great quality. I purchased two lots of singlets for my daughters baby in Canada. Over the years I have purchased lots of Bond products because the quality is just so good and it’s a household name. My daughter is very pleased I chose to shop with Bonds for the baby. Rated 5 out of 5 by qamelie from Staple in the wardrobe These vests are great for all seasons. As under garment during colder seasons or on its own during hot summer. Stretchy and comfy and the length is of good length to cover my toddler's tummy. Rated 3 out of 5 by JEM133 from It's a dress These singlets were much longer than I expected. They finish at my toddler's knees. It's great that they keep her warm so far down, but l the singlet creates bulk when she's in a onesie. Rated 5 out of 5 by DimaAA from Value for money. I bought a set with my first child and I was able to hand them down through to my third. Love’em. Rated 5 out of 5 by Lids from Best vests Such a great buy, soft and strechy fabric, will only buy these vests from now on for my bub. Rated 5 out of 5 by Nana Dianne from Good quality Am very happy with what I bought for my grandchildren,they wear beautiful and was great.